Thank you for checking my profile! I am one of the official tour guides of Kyoto city. I love the beauty of Japan and want to share it with you so that people can learn about Japan and enrich their trip. That's why I am here, offering guide services and tours! I hope I can meet you, show you around, and offer you an amazing experience! 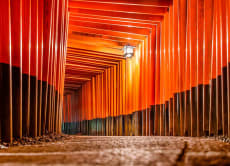 See Fushimi Inari on a Night Walk Tour with a Kyoto Guide!